Anisocoria is unequal pupil size. The pupil is the black part in the center of the eye. It gets larger in dim light and smaller in bright light. Slight differences in pupil sizes are found in up to 1 in 5 healthy people. Most often, the diameter difference is less than 0.5 mm, but it can be up to 1 mm (0.05 inch). Babies born with different sized pupils may not have any underlying disorder. If other family members also have similar pupils, then the pupil size difference could be genetic and is nothing to worry about. Also, for unknown reasons, pupils may temporarily differ in size. If there are no other symptoms and if the pupils return to normal, then it is nothing to worry about. Unequal pupil sizes of more than 1 mm that develop later in life and do NOT return to equal size may be a sign of an eye, brain, blood vessel, or nerve disease. The use of eye drops is a common cause of a harmless change in pupil size. Other medicines that get in the eyes, including medicine from asthma inhalers, can change pupil size. 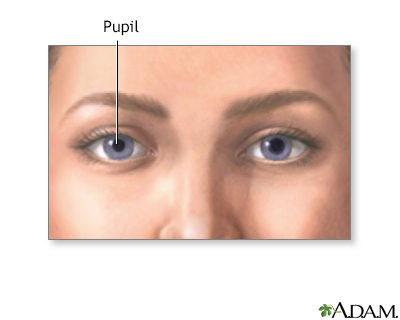 Treatment depends on the cause of the unequal pupil size. You should see a health care provider if you have sudden changes that result in unequal pupil size. Contact a provider if you have persistent, unexplained, or sudden changes in pupil size. The new development of different-sized pupils may be a sign of a very serious condition. If you have differing pupil size after an eye or head injury, get medical help immediately. Is this new for you or have your pupils ever been different sizes before? When did it start? Do you have other vision problems such as blurred vision, double vision, or light sensitivity? Do you have any loss of vision? Do you have eye pain? Do you have other symptoms such as headache, nausea, vomiting, fever, or stiff neck? Treatment depends on the cause of the problem. Baloh RW, Jen J. Neuro-ophthalmology. In: Goldman L, Schafer AI, eds. Goldman-Cecil Medicine. 25th ed. Philadelphia, PA: Elsevier Saunders; 2016:chap 424. Dhume KU, Paul KE. Incidence of pupillary involvement, course of anisocoria and ophthalmoplegia in diabetic oculomotor nerve palsy. Indian J Ophtalmol. 2013;61(1):13-17. PMID: 23275215 www.ncbi.nlm.nih.gov/pubmed/23275215. Thurtell MJ, Rucker JC. Pupillary and eyelid abnormalities. In: Daroff RB, Jankovic J, Mazziotta JC, Pomeroy SL, eds. Bradley's Neurology in Clinical Practice. 7th ed. Philadelphia, PA: Elsevier; 2016:chap 18. The pupils of an individual are usually very symmetrical in appearance. In certain instances the pupils may vary in size. Occasionally, differing pupil size is inherited and there is no underlying disorder. Varying pupil size may also be due to infection, tumors, disease or trauma.